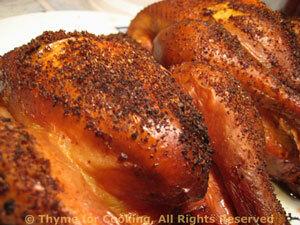 Grilled Cornish Hens with Spicy Rub, Thyme for Cooking easy gourmet dinners. We used shrimp for our starter, but you could use smoked salmon, ham or even leftover tuna. The little chickens are perfect for a single serving and any leftovers are perfect for snacks. The is a knife and fork sandwich, modeled on the famous Smorbrod or open-faced sandwiches of the Scandinavian (and Austrian) countries. If you have Avocado Cream left - have it on toast for breakfast. Peel and devein shrimp if needed. Melt butter; add lemon and pepper. Toss shrimp with lemon butter. Cook on barbecue grill for 5 minutes or until done. Or sauté in nonstick skillet for same amount of time. Remove and set aside. Remove avocado from shell and put into a bowl. Add the yogurt and mash with the avocado. Toast the bread. 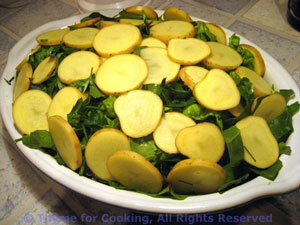 When done, remove the crusts and allow to cool. Generously spread the avocado cream on the toast. 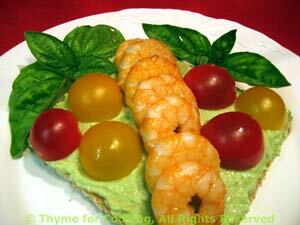 Artfully arrange shrimp and tomatoes, and serve. Cooked over indirect heat with a spicy rub gives these hens a crisp, flavorful skin. Both the dry mustard and pepper add a bit of heat. Mix all remaining ingredients together and sprinkle over birds. Cook hens on barbecue grill over indirect heat, covered, for 45 - 60 minutes or until done. Chicken is done at 160 F (70C) on your meat thermometer and/or the juices run clear when pierced with knife. 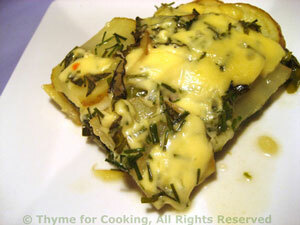 Or they can be baked in a shallow roasting pan in a 400F oven for the same amount of time - until done. When done, remove from heat, cut string and serve - don't forget finger bowls (it's messy) and bone bowls (to keep your plates tidy). Serve whole or cut each bird in half.